The sides of this gondola are bulging from years of carrying rough loads. Notice the bulging between posts as seen from the inside as well. Even that boxcar in the background has a few extra bumps. Freight cars take a lot of abuse. Loads are often dropped in without great care, forklifts are used to close stubborn doors, heavy loads shift in transit. All of these combined with the relentless attack of Mother Nature can take their toll on the sides of a freight car. Among the more severe examples of weathering are the bulging, warping and sometimes even pierced sides of cars caused by rough handling and shifting lading. Gondolas are most notorious for this, but similar effects can also often be found on boxcars and hoppers. 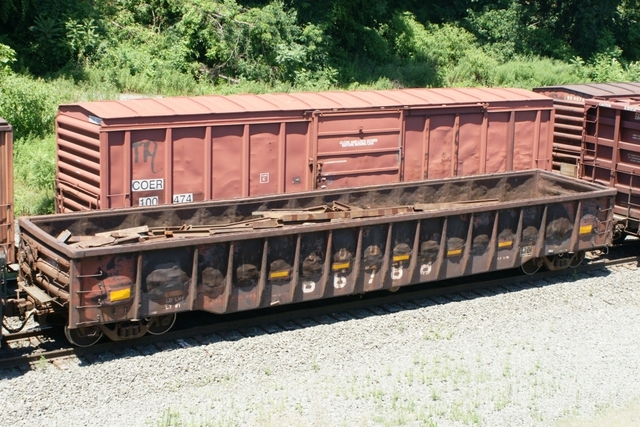 On coal cars especially, the acidity of the load can create holes in the car sides and floor. In some cases, railroads will replace the side sheets (the steel walls) of the car as they get too distorted or cracked. Other times, patches will be applied. In some cases, straw and foam have been used to plug holes. These can add more interest to cars, with a mix of old and new sides and paint. Recreating this effect on a model car is possible using some simple tools and a little practice. To learn how, read on. WARNING: Before you start, you should realize that once you have “damaged” the model, there is no reset button or going back. Work slowly and make subtle changes at first. Even better if you try warping a scrap piece of plastic before committing to damaging your rolling stock! 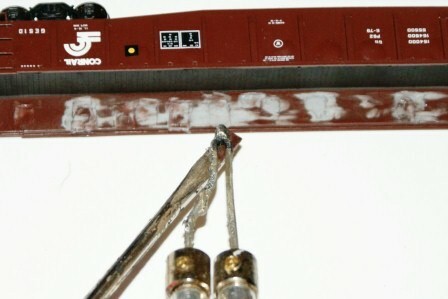 One easy technique is to warp plastic models with the use of a soldering iron or hot air gun. Use a soldering gun and screwdriver to bend the plastic. The scars on the inside of the car bare little resemblance to the bumps seen on the outside (at the top of the photo.). 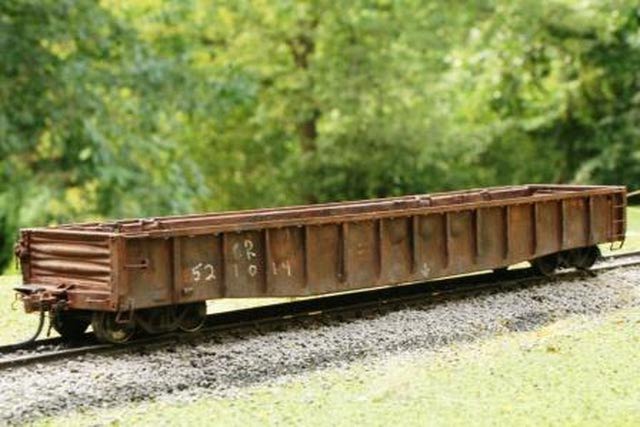 Recreating the look of a bulging or warped freight car only requires a few basic tools. Note: No two models are the same – different types and thicknesses of plastic will react differently. The technique is not difficult, but it is a good idea to practice on an old model or two until you’ve got the hang of it. To create the bulges on the outside of the car sides, you need to work from the inside. For gondolas and hoppers, access to the interior is easy. If your working on a boxcar, remove the roof or the floor so you can reach into the interior. Use a soldering iron or gun to heat a screwdriver. Different size tools will create different sized bulges. You could also use other metal objects for more variety. Just make sure whatever you use has a wood or plastic handle so you don’t burn your fingers. One final note about safety: you are melting plastic. Although it is in very small quantities, some plastics can release toxic fumes when melted. It is always a good idea to do this sort of work in a well ventilated area. Press the hot screwdriver into the back of the wall. The combination of heat and pressure will force the wall to bulge on the outside. Sounds simple right? Obviously it’s not quite as easy as it sounds. Model cars are thicker than the prototype; some more so than others. The right combination of heat and pressure can be elusive. The goal is to push out the sides without tearing or melting. Small tears really aren’t a problem – they show up on the prototype as well. You can reheat and reshape – but you’ll never make it flat again. Sometimes you only make it worse. If the plastic melts too far, try filling the gap with plastic contour putty. If its too big for that, make a new patch from a piece of aluminum foil – patches like this (usually with steel, sometimes wood) are common on the prototype. Or, you could take another cue from the prototype and use scenic grass material to create a plug of straw. Even if the bulges turn out perfect on the outside, you’ll still probably want to clean up the inside walls and add some additional weathering to both sides to pull the car together. A wire brush attachment in a rotary tool both smooths the rough edges and scratches the smooth surfaces. Note the damage inflicted on the “wood” floor of this gondola. The impressions left on the inside of the car walls will not look anything like the bulges you’ve created on the outside. Of course, you aren’t expecting the inside of the car to look any better. Still, you can smooth things a little in just a few seconds with a rotary tool. The main objective here is to remove any pieces that look like melted plastic. You can do this work by hand, but it will go much faster if you use a Dremel or similar rotary tool. You’ll need a wire brush bit. 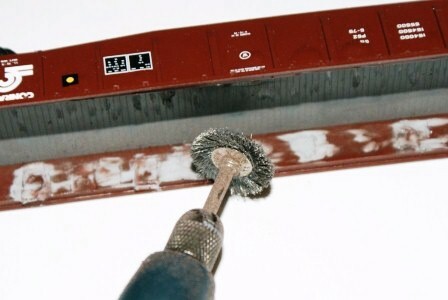 There are other grinding and polishing bits available that will likely work as well, but the wire brush tends to clear the plastic blobs better without creating plastic build-up on the bit itself. Safety Tip: Wear protective eye wear anytime you are working with this attachment and tool. Run the bit at a low speed and slowly grind the blobs smooth. While your at it, you can use the brush to scratch up the rest of the car interior as well. Add some chips to the floor, scratches on sides, etc. Remember that Dented and bulging sides are just one part of the overall look, and you will probably want to use additional techniques to complete your project. The car was finished with oil paints, acrylics and chalks to represent a very well-used car. The careful work of distressing the car sides is now complete. To make your work stand out, you can highlight the details with a little weathering. Although cars can be repainted without having dents removed, generally there will be some signs of grime, rust or general weathering on these cars. Whatever techniques you use, this weathering will be the fitting final touch to your models.